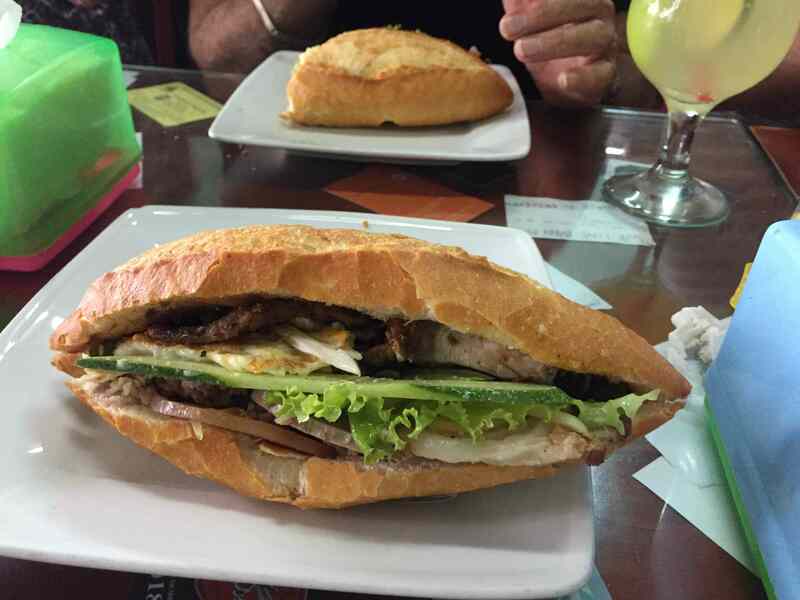 Hoi An Banh Mi – The World’s Best Sandwich? 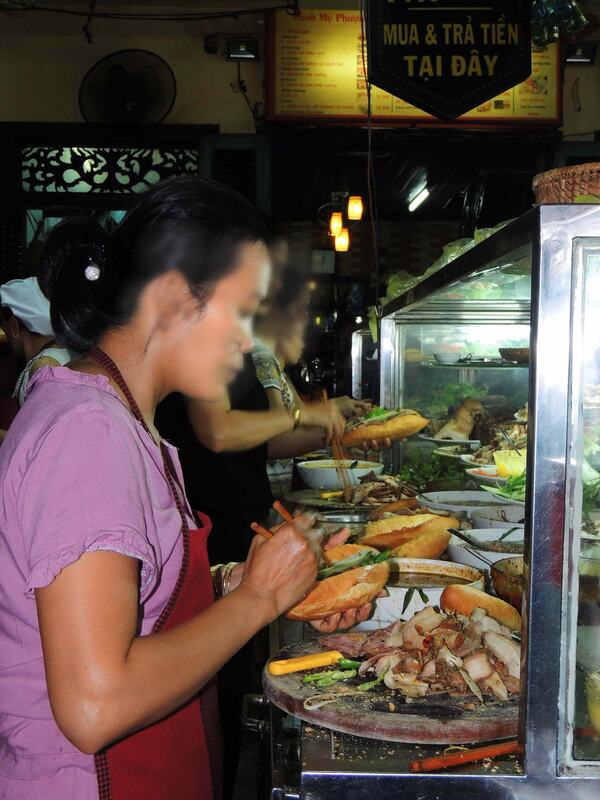 This post about banh mi is a continuation from Hoi An: The Food! 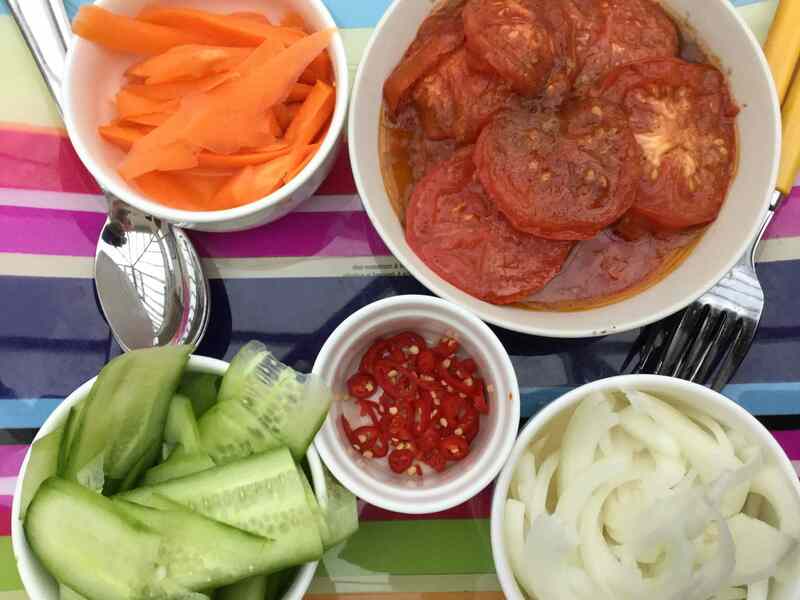 Later in this post we will give our method for making a banh mi (pronounced ‘barn mee’) that is truly yummy and clearly in the Vietnamese style. It isn’t a traditional recipe, but it encapsulates the key characteristics from our experiences and the numerous recipes that abound. There is quite a lot of preparation required but much of it can be done beforehand. It is great to have some friends around to share: we have everything ready and everyone makes their own rolls from the platters and bowls in front of them. Follow our guidelines and your results will be rewarded. Will we give an Aussie twist? There are several key requirements for making this distinctly Vietnamese ‘sandwich’. The next photo is a hint to one of them. To decide on what is the world’s best sandwich, we first need to define ‘sandwich’. To Australians, a ‘sandwich’ used to mean two slices of bread, spread with butter, and with a filling of meat, cheese, salad or vegetables in between. A ‘roll’ was not a sandwich but a small loaf of bread, generally round shaped or torpedo shaped. A ‘filled roll’ was a roll sliced almost in half and containing the same range of fillings that could be used in a sandwich, that is, butter, meat, cheese, etc. The meat used could range from ham, to slices of roast to tinned tuna. The key feature of a sandwich or a roll is that you can pick it up and eat it in your hands. Over time, particularly since the 1980s, the meaning of ‘sandwich’ has expanded as we have discovered different types of ‘sandwiches’ from around the world. In Australia a BLT means a bacon, lettuce and tomato sandwich. 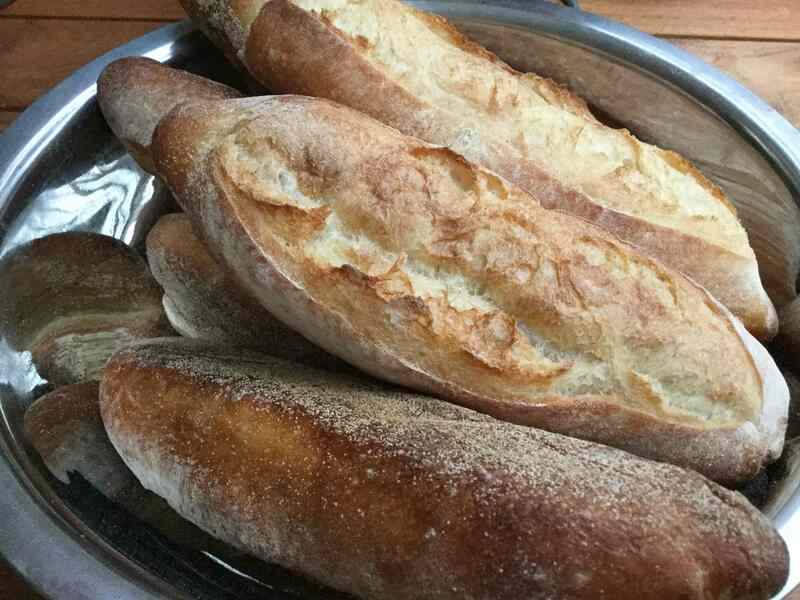 Rolls might now be called buns or small baguettes, or refer to a section from a large baguette. We have all sorts of hamburgers, which are sandwich-like but with some hot ingredients, including a grilled meat pattie. From our middle-eastern immigrants we have discovered wraps (pita bread rolled up with all sorts of fillings inside), while souvlaki is skewered meat also wrapped in pita. The Mexicans have their tacos and burritos. And the Vietnamese have their banh mi! On the street food tour on our first evening in Hoi An, we were taken to Banh Mi Phuong where Madam Phuong is said, by some, to make the definitive version of this filled roll. We would learn a lot that evening. The Vietnamese term for bread is ‘banh mi’. But it possibly refers to a small baguette in the shape of what Australians would call a bread roll. However, unlike ours, it is a very light bread roll with a remarkable crispy crust. 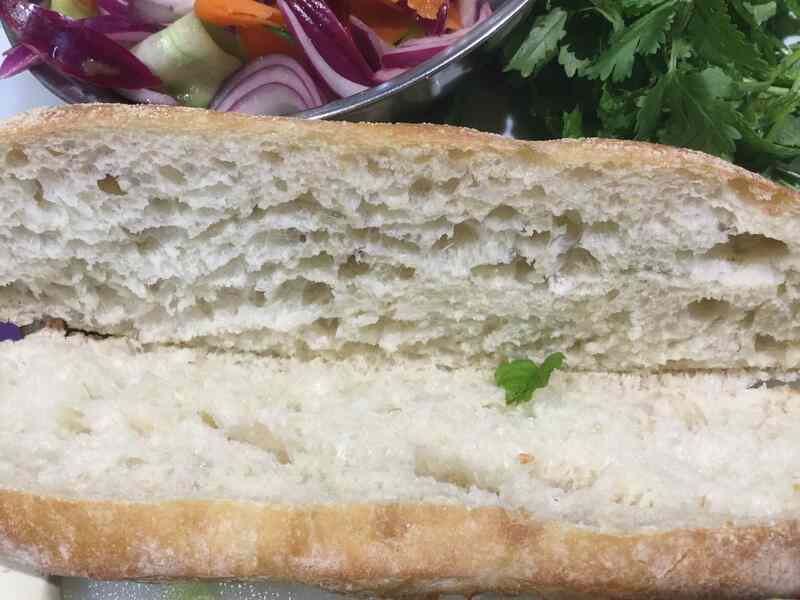 You can read more here Banh Mi – Wikipedia, where it is explained that the roll is often airier than the European baguette and that the crust is also thinner and crisper, possibly due to the rolls being made from a mixture of rice and wheat flour. Over time, the term ‘banh mi’ seems to have morphed away from meaning just the bread roll itself to meaning the roll once filled (in the Vietnamese style, with meat, herbs, etc.). You can read about the possible ingredients used in the filling in the link just given. 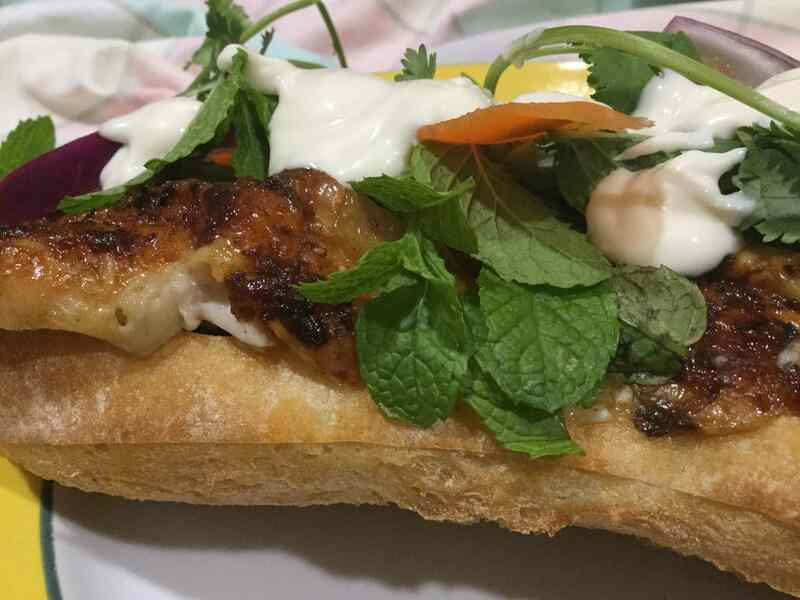 And you can read more about the Hoi An version of banh mi and the restaurants there in this link Hoi An Banh Mi. 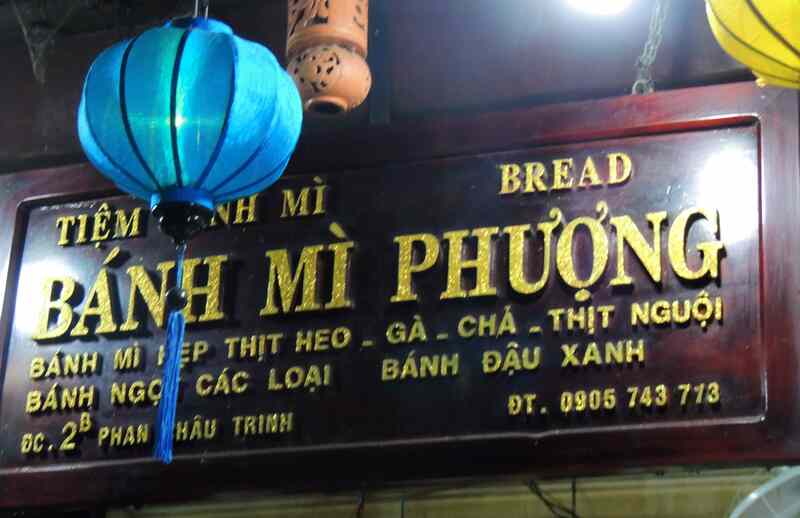 While it is not the only outlet for banh mi in Hoi An, Madam Phuong’s is the one perhaps most widely recognised, sometimes being claimed as producing the best banh mi in Vietnam (and therefore, presumably, the world). The second link above summarises the key ingredients and also mentions that the bread rolls are baked right next door to Madam Phuong. 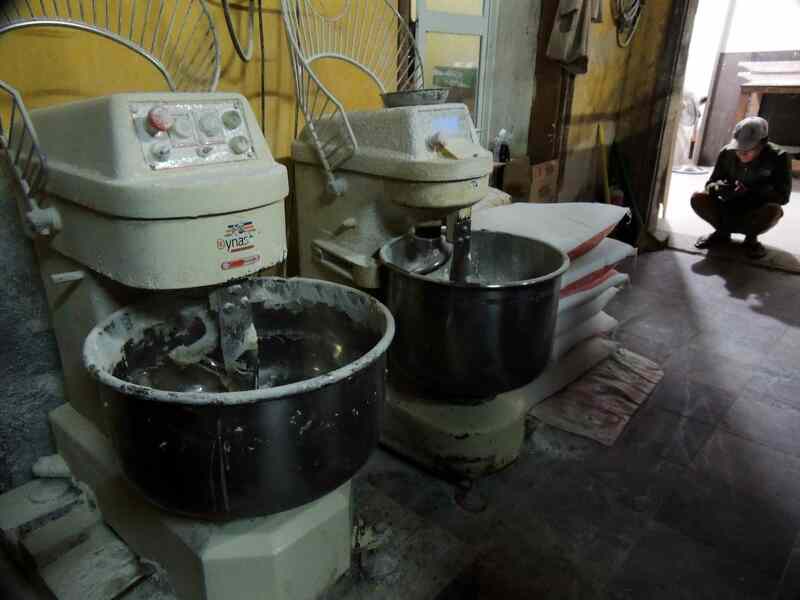 The following photos show the production line producing around 2,000 serves a day, a finished ‘sandwich’ and the bakery next door producing the rolls with the extraordinary crispy crust. Meat that is truly tasty, and later we give a few suggestions. Plain roast pork can be rather tasteless. Instead, if you are after a superior result, try the recipe below for pork and pineapple with crackling. 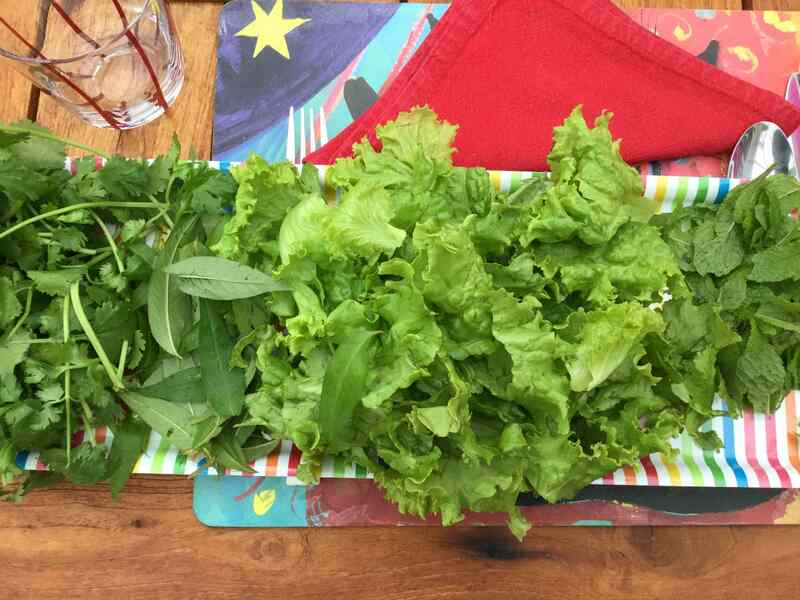 Herbs and salad greens that are truly fresh. Other flavourings including pickled vegetables and mayonnaise. Rolls that are really light and with a crisp crust. 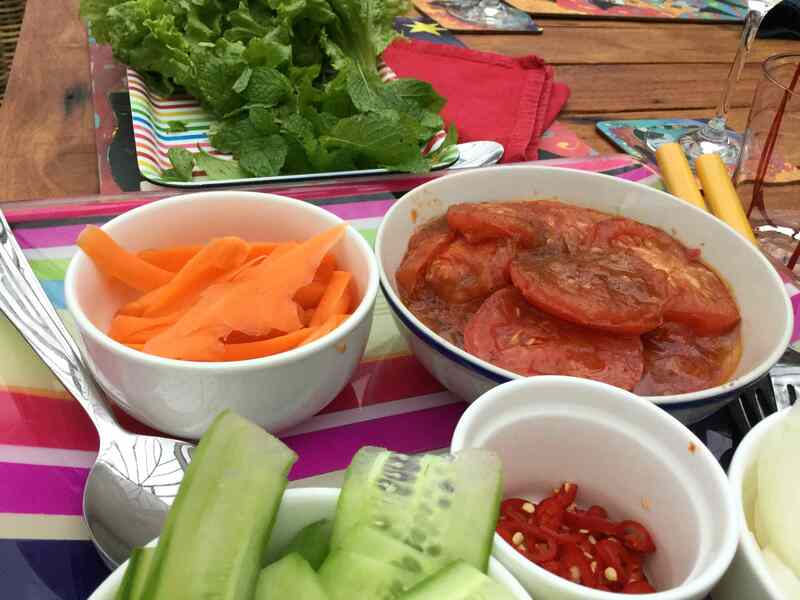 We examine these in more detail below, followed by instructions for assembling the banh mi. This recipe might appear to be outrageously complicated and very time consuming, but in fact it is neither. The meat ingredient will probably require the most work and time, so start that early. Perhaps have the other ingredients ready at least half an hour before you want to put the banh mi together. The recipe is for four serves but you can easily increase the quantities. If you are having a banh mi party, you could easily set up a production line to quickly feed heaps of people. To crisp the rolls up a bit, you could turn your oven to full bore (240oC or so) then pop the rolls in for several minutes before serving. Or you can put them under a griller or open them and grill very lightly on each side. As a minimum, heat the rolls so they are warm inside, but not hot. You can make a slice along one side of the rolls/ buns/baguette to open them up. Or you can slice them all the way through. And if you really are adventurous, you could create an Aussie version with a suitable kangaroo or wallaby recipe! Use some or all of the optional ingredients below but try not to leave many out. The quantities given allow for four rolls. Recipes often say to pickle the carrot, cucumber and radish. However, we prefer to just moisten them in vinegar for a short amount of time, along with some sliced onion; it seems to give a fresher taste. We find the tomatoes add extra juiciness. Pork or chicken liver pâté is sometimes included, but we tend not to use it as there are many other flavours going on. However, use it if you wish, spreading some over the inside of the roll. Cut each tomato into four thick slices. Heat oil in a frying pan and gently fry each slice on both sides until some of the liquid dissipates. Season lightly during cooking. Set aside and reheat to warm before assembling the banh mi. Wash and thoroughly dry the above ingredients. Serves 4. Serve on individual plates. Allow a couple of serviettes per person for dripping chins and hands! Degree of difficulty: 3/5 (moderately difficult) when allowing for the preparation of all the ingredients and the need to be well-organised. Equipment: Saucepan, casserole or frying pan for cooking the meat. 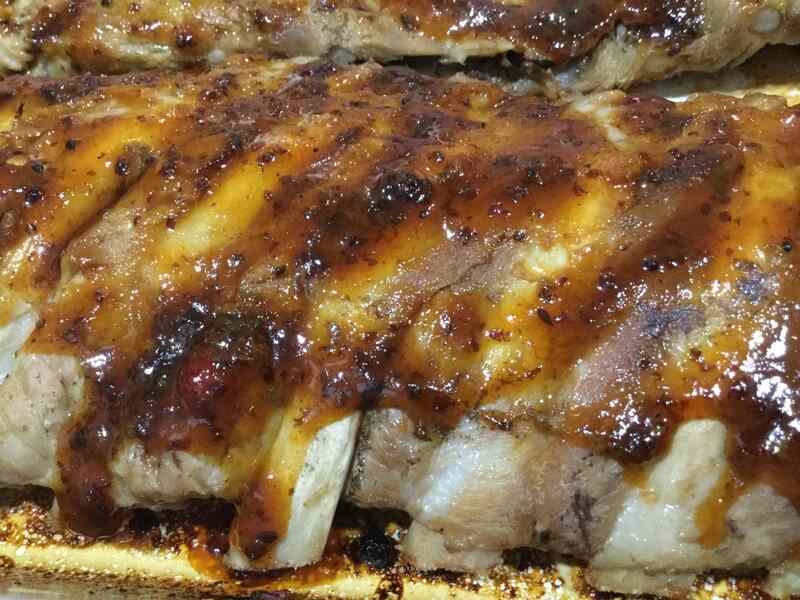 The method we give here uses strips of belly pork and is based on Donna Hay’s recipe for Texan-style pork ribs which we covered in an earlier blog post: pork spare ribs. We have adjusted the ribs recipe to add Asian flavours to the pork strips, making it perfect for banh mi. Crackling is prepared separately. 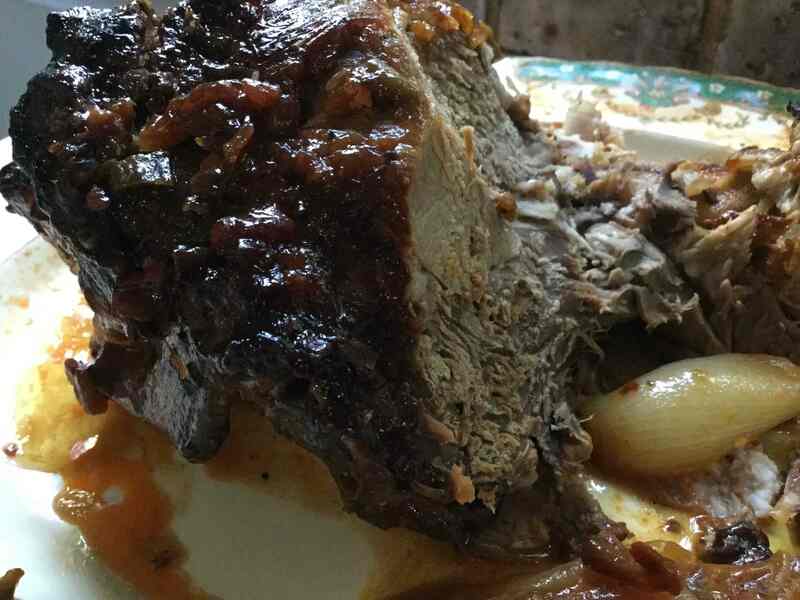 The pork meat is cooked in two stages: first, the strips are first cooked in a simple stock and then they are baked in a spicy sauce. The first stage can be done well ahead of time and you can leave the pork to sit in the stock until required. Drain and pat dry before baking. The baking stage can also be completed well ahead of time, with the meat and sauce reheated gently when preparing the banh mi for serving. The ingredients and methods for cooking the pork and crackling are given below in stages. The crackling is really worth the effort because of what it adds to the final result. Slice the pork into strips 1½ to 2 cm wide. Remove the skin and retain to make the crackling (or you can remove the skin first in one piece before slicing). Trim some fat off each strip if it is excessive but don’t be afraid to leave some on. Set the strips aside to be cooked in the stock. To prepare the skin to make crackling, first score each piece of skin with several cuts. Sprinkle with salt and allow to sit uncovered for an hour or so in the fridge. Pat dry when needed. Or pat dry after half an hour or so and then replace uncovered in the fridge to dry further. You can cook the pork and the crackling together, but be careful not to over-cook the pork strips and dry them out. If you have time, or two ovens, cook them separately. (optional but preferable) 6 to 8 strips of fresh pineapple (roughly 5 cm long, 1.5 cm wide). For the pork strips, place the sauce flavourings in a suitable casserole or small baking dish. Combine well. Add the drained cooked pork strips and pineapple and toss through the sauce. Cover with a lid or aluminium foil and cook for 15-20 minutes. Remove the cover or foil, toss. Cook for a further 10–15 minutes or until dark golden brown and the sauce becomes sticky (toss the pork once or twice to coat with the sauce during the baking time). Don’t overcook the pork or dry out the sauce (add a dash more stock if needed) – the pork should be soft and tender. Set aside until needed; reheat to warm before preparing the banh mi. Don’t worry too much about the fattiness of the pork. Remove some if necessary, otherwise any that remains makes the banh mi even more delicious; some Vietnamese dishes can be quite fatty or oily. 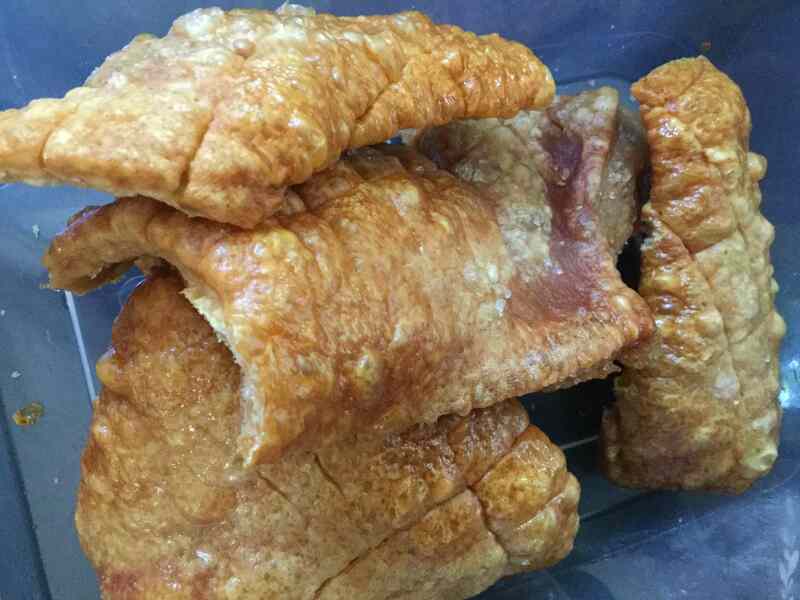 If you want to have crackling – which you must – place the pork skin (skin side up) on a suitable tray lined with baking paper and place in the oven at the same time as the pork strips. Remove when crackling is ready. Pieces that have not crackled can be finished off under the griller. 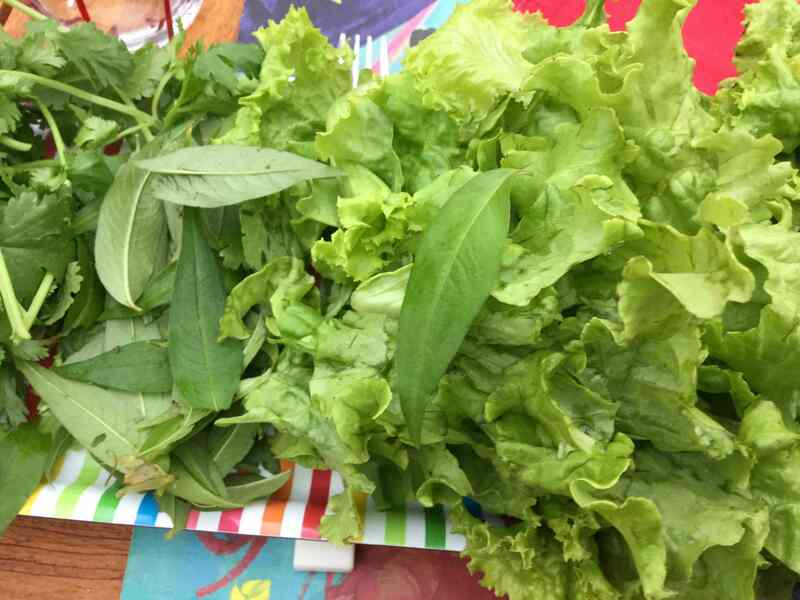 Click here for the continuation of our gourmet tour of Vietnam: Mekong Delta.